Sometimes I wish there could be 48 hours in a day so that I could take care of everything I need to do. Fortunately I’m rather good at multitasking my way through the measly 24 hours we’ve been allotted; but unfortunately, I end up rushing through certain moments and do stupid things like lock myself out of my apartment. (Daddy, if you’re reading this, I SWEAR I’m not as bad as my mom is!) That is how my otherwise energetic and productive morning went today, so needless to say, I was a little flustered and mad at myself by the time I got to work. But one thing did keep me smiling all day long, and that was learning that I was nominated for a Foodbuzz Food Blogger Award (see my previous post). Even if I don’t win, I’m still really honored to be considered for any award, and I thought it would be fun to treat myself to a little celebratory dessert tonight. It had been awhile since I’d made a nice batch of crepes. I hadn’t forgotten about them, I just never ended up fitting them into the late summer months’ menus. With the recent fall-like weather (I say “fall-like” because it’s supposed to heat back up this weekend. O California weather, thou art so fickle) and Halloween decorations cropping up all over the place, I decided to give my first nod to one of my favorite holidays with a twist on a Halloween favorite: caramel apples. Though the idea of the caramel apple is pretty much a perfect Kimberdessert, I shy away from them because I’m petrified of losing a tooth during the eating process. I don’t like to be deprived of potential treats and took the basic genius equation of caramel + apples and stuffed them inside a crepe. Follow the basic crepe prep instructions here. Prepare the caramel by placing the sugar into a saucepan and heating it over medium heat, whisking vigorously as it starts to melt. When the sugar boiled to a liquid and a light to medium amber add the butter and whisk together. Remove from heat and add the milk or cream, continuing to whisk rapidly. The mixture will foam up so be careful when handling. Add the cinnamon and continue whisking until completely smooth. Set aside. Heat the butter over medium heat in a large skillet and add the apples when the butter has melted. Add the sugar & cinnamon and cook until the apples are tender, but not mushy. 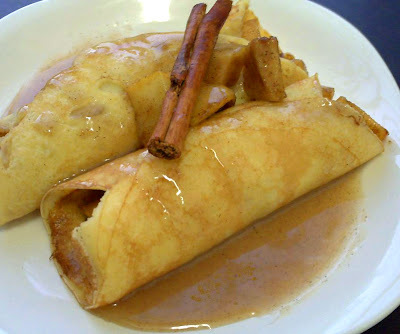 Fill the crepes with the apples and a small amount of the caramel sauce. Roll together, garnish with extra apples and drizzle generously with the caramel. Enjoy! Looks yummy! I like to make strawberry crepe and put nutella on it - much cheaper than the store versions too! These look unbelievably yum! Now that its Fall in L.A. too, we'll have to try them. Congrats on your recent Foodbuzz nomination too! OMG these were good. Never made crepes before, think I've been wasting my life. They're so easy. This is so simple... I have all the ingredients in my cupboard and the apples on my tree. Making this tonight! Yum. Also cinnamon works very well with apples!